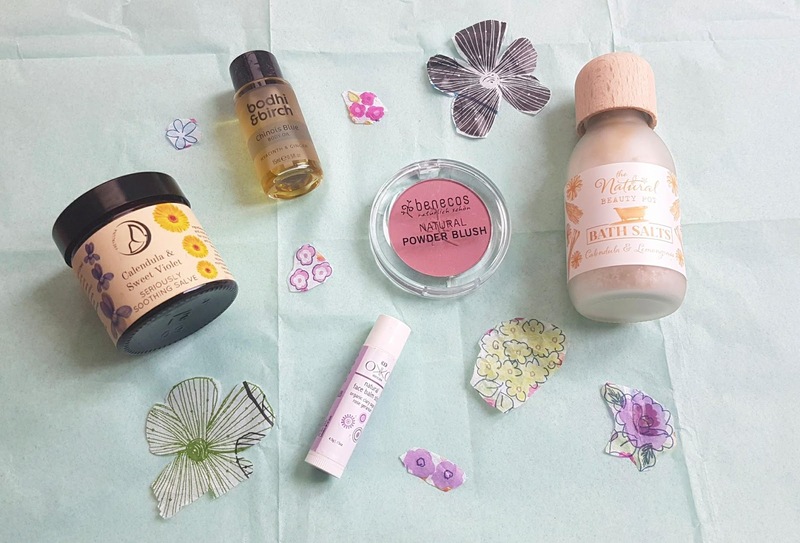 The Natural Beauty Box: February Flower Power! The end of the month always is a bit dull for me, as I don't get many goodies through the post and everything seems to start to drag a bit. Well, not anymore! The Natural Beauty Box, a subscription service that delivers natural, cruelty free, and vegan-friendly beauty treats to your door each month, ships towards the end of the month. I have found my new favourite pick me up! 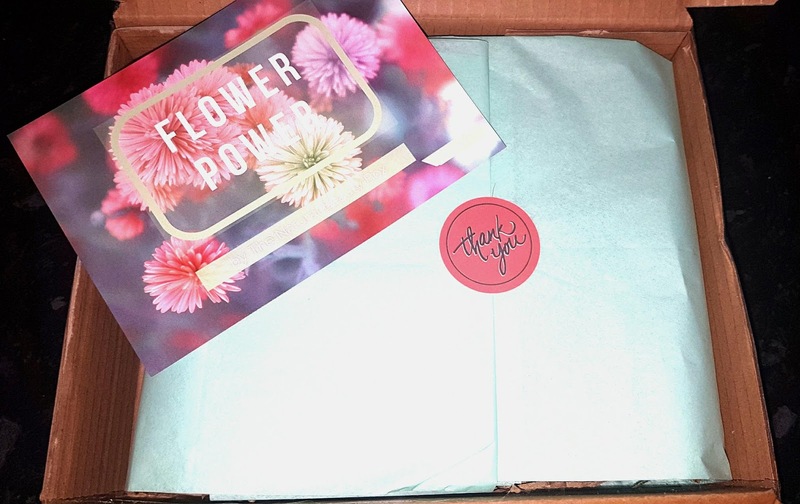 I first heard of The Natural Beauty Box last year, and every month I would see the reveals go live on Instagram, Twitter, and Facebook and be green with envy. It always looked so fantastic, and not once did I see anything less than perfect. And if you remember, I was lucky enough to win a limited edition winter box back in December -- again, this was just perfectly picked and presented! So you can imagine how excited I was to finally get one of the official monthly boxes -- I definitely squeee'd a little when my postie came today! The February Box is so adorable and packed full of high quality products. This flower powered box is worth nearly £58, and offers three full size items plus two deluxe samples. I have to say, even beyond just the amazing value of the collection, I think Emma has selected such brilliant goodies to help us all get through this final stretch of winter, and I have to express how thankful I am for that. The final months of winter are so hard for me, and the February edition is truly a much needed little box of sunshine. The first item in the box is from The Natural Beauty Pot, a Northern-Ireland based artisan company that hand makes each of the water-free products. 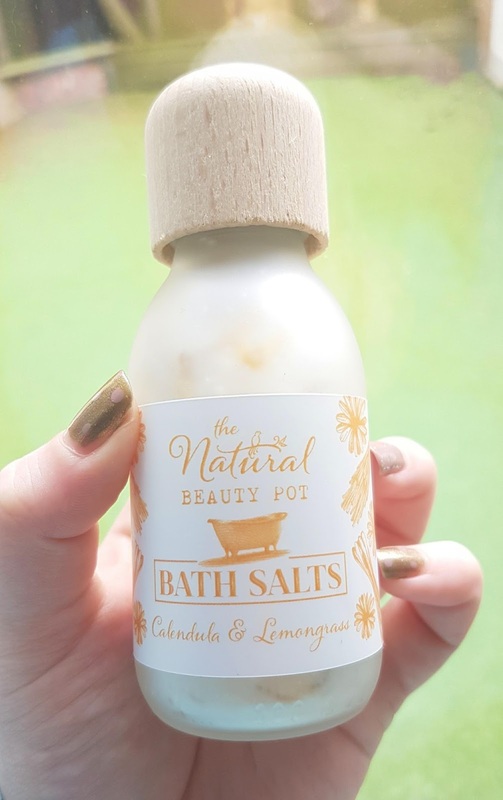 The bath salts are a blend of epsom salts, calendula, and lemongrass, and are ideal for detoxing muscles, and reviving and energizing the body, mind, and spirit. This is one of my favourite picks in this box, as I love my weekly bath -- this is my time for silence and for complete relaxation. I am new to the world of bath salts, and have only recently started using them regularly, but I can already tell that this bottle from The Natural Beauty Pot is going to become a staple in my house. They smell divine, and I love that the packaging is totally recyclable. A huge win in my book! Plus, for £16, they are within my price point -- another win! Next up is the Chinois Blue Body Oil from the magical Bodhi and Birch. You all know my love (or hoarding problem?) of oils, so I was really happy to see this vial of joy included in the February box. 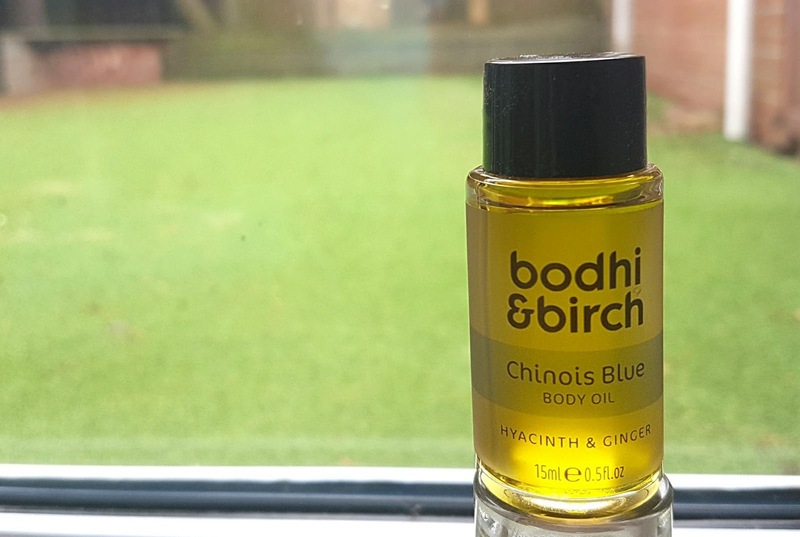 Meant to replicate the decadence and elegance of the French Chinoiserie, the body oil is expertly blended with a variety of indulgent ingredients, including honeysuckle, sweet hyacinth, pomegranate, blue tansy, ginger, ylang-ylang and more. For me, it smells of a spring sunrise -- delicate, sweet, and full of life. 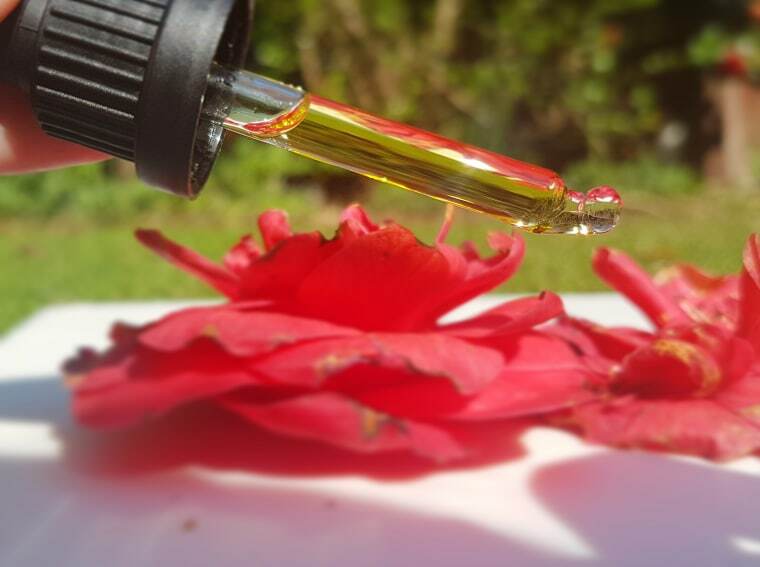 This will be the perfect body oil to use after my morning shower, and I can't wait to feel the uplifting power of the blend every day! Normally £42 for 100ml, I love that I get to try this generous sample size before buying the full bottle. 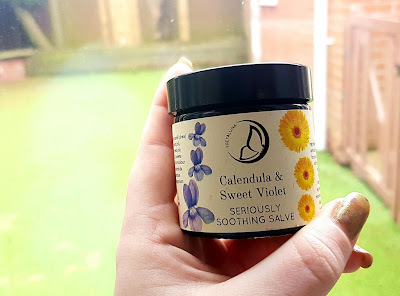 Another one of my favourites from the February Flower Power edition of The Natural Beauty Box has to be the FreyaLuna Seriously Soothing Salve -- the scent of sweet violet mixed with the healing properties of calendula make this a 'seriously' powerful product. The violet is not overpowering, but rather acts as a second note to this super hydrating salve. The main smell is actually hard to pin down -- its a lightly sweet and earthy nose, and I find it perfect as it is not dominating at all. The balm is meant to be perfect for helping treat psoriasis and eczema, dry and chapped skin, or when used very sparingly, as a quick and easy spot treatment. My partner suffers from mild eczema, so this will be perfect for soothing those areas. 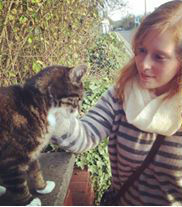 For me, I am loving it on my hands at the moment. Since the winter has been so long, cold, and windy, my hands have suffered more than usual, and already I can feel how the rich formula is treating my irritated skin. This is one of the higher priced items in the box, coming in at £25 for 60ml, but already I can tell how high in quality and effective it is, so I might need to splurge on this pot again in the future! 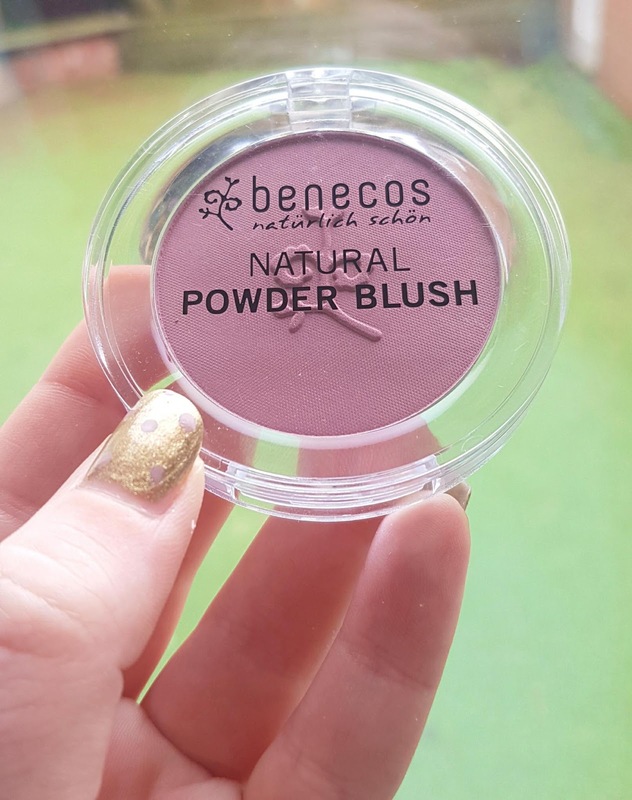 The fourth item in the collection is the gorgeous blusher from Benecos in the shade Mallow Rose. I think I have mentioned before my initial hesitation about using blush, as I always found them to make me look a bit clownish. My very pale skin is prone to flushing (usually at inopportune times may I add!! ), so I was always nervous about making it look even more rosy. However, after a recent re-attempt to use this classic makeup product, I found that it wasn't the blush itself that had been the problem in the past -- it was my application of it! Having this Benecos blush included is actually great for me, as it means I can keep practicing, and hopefully I can eventually perfect the look. This shade is so lovely, and I think it will suit my skin tone pretty well. The formula is really smooth, and when blended out it gives a really subtle and natural flush, and I actually think the shade is perfect for spring. It is not too pink, nor too dark, and knowing it is 100% natural and organic makes this product even sweeter. Even better, it is only £5.95, so if I fall desperately in love with it I can definitely afford to get another and even trial out other shades! ages, and I am so happy to have another as I ended up loving the first one I got earlier this month. 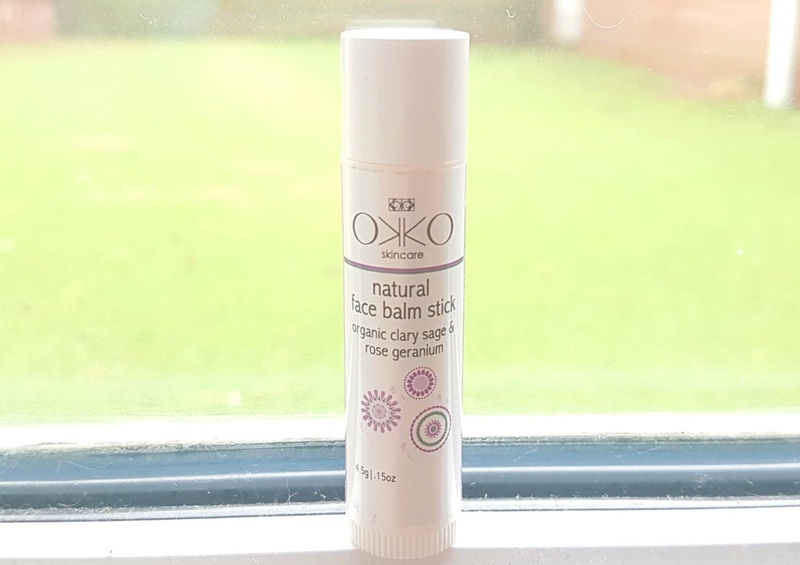 Okko is a British brand that focuses on crafting all natural solid balms that are perfect for multi-tasking. Now, normally I don't get on with balms on my face -- I tend to reserve their use to other parts of my body because I find them too heavy for my easily irritated face. But this Okko balm is actually really light, and it has not given me any unsightly spots. This Geranium and Clary Sage one smells so amazing, and I love knowing that the relaxing lightly floral scent is doing more than just acting as fragrance. The ingredients are moisturizing, soothing, and healing, so my skin is being pampered while my mind is being calmed. For £4, I couldn't ask for more! If you have not checked out The Natural Beauty Box and you are a lover of cruelty free, natural, and vegan-friendly products, you should definitely head over to their website and see all the lovely subscription and one off options they offer! Each month is always perfectly thought through and the products come from both mainstream companies and bespoke brands, making it ideal for both the new greenie and the experienced ethical buyer. Rolling subscriptions are only £24.95/month, but you can get money off for 3, 6, or 12 month packages. Plus, you can grab 10% off your first box by using code FIRSTBOX10 -- but be quick, the February box sold out quickly, so be sure to get your order in for the March box ASAP! What a great box these products sound amazing and I'm getting more into natural products recently. ooh so glad to hear you're getting into natural products! :) what has been your favourite product you've tried recently? I love how pretty the box is, and then how natural all the products are, really draws you in and makes you want to buy them. The soothing salve with the addition of violet would be perfect for my skin as I suffer with eczema a lot.